Kanye West: Empathy or Empty Apology? Every year on Thanksgiving Day, millions of viewers tune into the Macy’s Thanksgiving Day Parade with thousands of performing entertainers to celebrate the festivities. This year, Kanye West made an appearance on the Big Apple float with an unhappy audience booing and chanting “Taylor” as West passed the crowd. 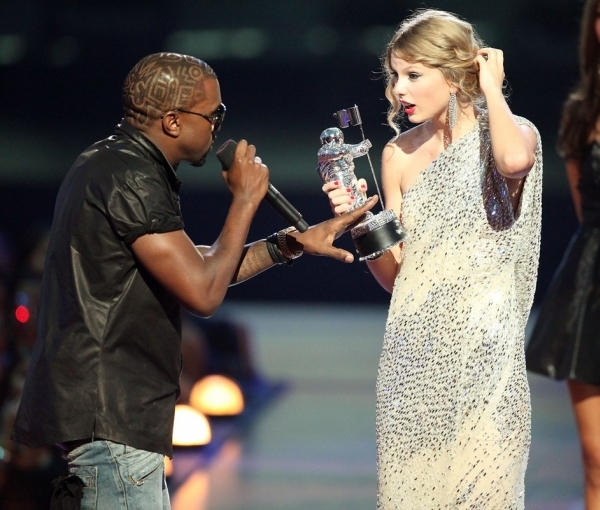 Although the MTV Video Music Awards incident occurred more than a year ago, people haven’t forgotten West’s interruption during Taylor Swift’s acceptance speech, voicing his opinion that Beyoncé had the best video of the year. In fact, people haven’t forgotten a lot of things West did in the past, and his reputation continues to suffer. West has made many PR mistakes over the years. Besides his rash actions during the MTV Video Music Awards, one of his more unpopular public incidents was calling President George Bush a racist not too long after Hurricane Katrina in 2005. Not only was it brash and uncalled for, but also it took him five years to make an apology on The Today Show with Matt Lauer. West was invited on The Today Show to redeem himself and publicly apologize for his accusations against Bush. This “redemption” interview with Lauer, however, didn’t improve his reputation. West was rude and seemed aggravated with the way the interview was set up. According to The New York Times, West went on a Twitter rant geared directly toward Lauer and The Today Show. West complained the video clips aired during the interview were a disruption and claimed they manipulated his responses. West later stated on Twitter that he would not be returning to The Today Show. It’s unclear what “the set up” really was, but to West, The Today Show was out to get him. Where is his PR representative? Do they not care or can they simply not control his actions? Does West even care that the majority of the public disagrees with his actions? Likely not. His career hasn’t suffered; he continues to produce award-winning music with plenty of loyal followers. Why change anything? Most celebrities fight hard to uphold their reputations, especially after they have made poor decisions upsetting the public. West sees himself differently, however. Some celebrities want to bounce back from their mistakes to make amends with the public. Michael Vick served his time and openly participated in an interview on “60 Minutes” answering any and all questions that were asked about his dog fighting past. After spending time in jail for drug-related charges, Robert Downey Jr. restored his career and became clean after checking himself into a rehabilitation center. Bill Clinton publicly admitted to, and apologized for, committing adultery while in presidential office. Everybody has an opinion and everybody makes mistakes, but being a celebrity comes with strings attached. Sometimes that includes stepping up to the plate, accepting full responsibility, answering the pressing questions and meaning every word of it. If the public doesn’t seem satisfied, try again. West may never give in to this norm of responsibility until he sees a career shift. Until then, people will continue to disapprove of him. As an Atlanta native, I never saw Michael Vick, the former Falcons quarterback, making a comeback. In 2007, Vick was convicted of running a dog fighting ring and training pit bulls for fighting purposes. Avid football fans all over the U.S. were disgusted with his behavior. How could a man so powerful and wealthy practice such cruelty? Lately, however, Vick seems to be one of the NFL’s most exciting talents. After his release in 2009, he signed with the Philadelphia Eagles as a third-string quarterback. Now he is leading the Eagles, possibly to its first Super Bowl title. How has Vick’s image changed from convicted felon to star athlete within a year? The answer is simple: great PR tactics. In a 2009 article on NPR’s website, PR professionals suggested Vick implement a three-step process in order to rehabilitate his image. Vick needed to show genuine regret for his actions, avoid constant media attention and prove he changed his ways. To his credit, Vick and his PR team followed this process in perfect form. Vick returned to the spotlight on Aug. 19, 2009, with his first interview on “60 Minutes”. In this interview, Vick admitted his faults and seemed open and honest with the public. “When I was in prison, I was disgusted, you know, because of what I let happen to those animals,” Vick said. He also addressed his faulty reputation as a player. After the “60 Minutes” interview, Vick began the daunting task of rehabilitating his off- and on-field reputations. Off the field, Vick volunteered with the Humane Society of the United States and spoke at schools. Vick said he participated in these activities because he believed many destructive behaviors can be prevented. Although giving back to the community was important, Vick realized repairing his on-field image would be more difficult. Vick’s new work ethic saved him from failure. Over the past 15 months, Vick developed the reputation as a hard worker, with coaches reporting he is continually the last player to leave the field after practice. With his new outlook, everything fell into place for the star quarterback. 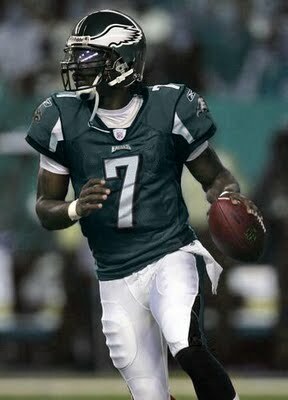 Last spring, Vick was promoted to second-string when the Eagles unexpectedly traded Donovan McNabb to the Redskins. His role as back-up quarterback quickly changed when Kevin Kolb suffered a concussion during the first game of the season. Now, the convicted felon is giving the Eagles a season no one expected. On the Nov. 15 game against the Redskins, Vick completed 20 of 28 passes for 333 yards and scored four touchdowns. The Eagles crushed the Redskins with a 59-28 victory. The Pro Football Hall of Fame requested the jersey Vick wore during the seemingly flawless game. Maybe players with suffering reputations should follow in Vick’s footsteps. It is important to be honest and open, but it is also imperative to focus on the path ahead. Players shouldn’t continuously focus on their faults or appear in the media constantly. If anything, they should show their fans they are working toward the goal of victory. We’ve all seen status updates on Facebook stating the corresponding user is associated with a certain cause/religious faith/political ideal and dares others to post the same status, claiming that anywhere from 93 percent to 97 percent “won’t re-post this.” Where do those statistics come from? Nowhere. They are assumed and fabricated. There is something very comforting about a statistic. Numbers are clear and simple and seem to hold no bias. However, just as in the Facebook status example, stats can be just as easily manipulated as any other fact. Oxford mathematician, Peter Donnelly, gave another, more serious example of wrong and careless use of statistics in a TEDOpen Translation Project speech back in 2005. He told the story of a British woman, Sally Clark, who gave birth to twins, both of whom died from sudden infant death syndrome (SIDS). The mother was tried and convicted of murder because a then-distinguished pediatrician said the chance of both babies, who were born to a professional, non-smoking family, dying fromSIDS was one in 73 million. Donnelly later went on to explain how this claim was not only bad math but also a blanket use of statistics. Thankfully, Sally Clark was later acquitted of the crime, and the doctor was faced with a disrepute charge before the Britain’s General Medical Council. Statistics are dangerous things. They can be presented as truth with little to no support to back them up. They are used and abused and misinterpreted. Misrepresentation happens easily in everyday life, but, surprisingly, it also occurs in the professional realm as well. How can we, as future or current PR professionals, use statistics responsibly and ethically? Psychologist John Grohol’s blog “Bad Statistics: USA Today” on Psych Central outlined the important use of context in relation to statistics. Grohol cited a USA Today article that used the statistic, “Since 1970, the percentage of people ages 18 to 34 who live at home with their family increased 48%, from 12.5 million to 18.6 million.” He said the statistic sounds great . . . except for the fact that population growth within that 36-year period was not taken into account. Also, in 1970 many aged 18-34 were drafted for the Vietnam War — the 1970 number would naturally be lower. We should always make sure to check the background of any statistics we use. Our goal is to help our client, but another one of our goals should be to provide factual, relevant information to our audiences. Check the context of all statistics and make sure the information is being presented in its correct light, and ensure you are not making wide-sweeping claims based on these statistics. Baby Einstein previously claimed to improve a baby’s cognitive development and prepare them for future education, according to the article. Baby Einstein also released a variety of baby-related statistics as good PR for the company, which, whether the statistics were true or not, helped create a false image of validity and reliability for the company. Vicky Rideout, vice president of the Kaiser Family Foundation, stated in the New York Times article that companies were more careful with blind claims after the Baby Einstein case, but misuse of statistics still occurs. Statistics can be very useful and fun in highlighting trends to your audience, in creating a message and in tracking the success of a campaign. Just keep ethics in mind, and there shouldn’t be any problem! In his apology, the host called the ordeal an “injustice.” However, just days before Politico broke the story, Olbermann interviewed Arizona Rep. Raul Grijalva, one of the politicians to whom he gave money. Olbermann did not disclose his connection to Grijalva at any point during the interview. According to the Society of Professional Journalists’ Code of Ethics, a journalist should “be free of any interest other than the public’s right to know” and should “remain free of associations and activities that may compromise integrity or damage credibility.” Does Olbermann not consider openly favoring one political party over another to be an injustice to his viewers? While I do give credit to Olbermann for using his first show back as a platform to talk about transparency, I have to wonder, whose idea was that? Rumors of a publicity stunt have been circulating since the story broke. For a network that consistently ranks at the bottom of news outlets, it’s certainly possible that these rumors are true. But did MSNBC’s hard-line stance against the “Countdown” host work? It’s hard to say. Sure, these actions caught the nation’s attention, but I’m not sure it had the effect MSNBC was hoping for. Whether you side with Olbermann or not, most of the nation seems to agree that a weekend suspension is more of a slap on the wrist than a time out. The network’s response came across as more of a publicity statement for MSNBC than as a statement against Olbermann. But then again, why would a network want to harm the reputation of its most popular host? It seems as if neither Olbermann nor MSNBC took this issue very seriously. Neither seemed to think of the ramifications their actions would have on their image. Their wishy-washy attitudes toward the practice of serious journalism don’t help either. Do you think Olbermann’s actions will hurt his reputation? Did MSNBC’s response hurt or help the network? The University of Alabama (UA) in Tuscaloosa paid homage to alumni Autherine Lucy Foster, James Hood and the late Vivian Malone by hosting an event recognizing the three individuals for their contributions to the school. On June 11, 1963, Alabama Gov. George Wallace stood in the doorway of UA’s Foster Auditorium to prevent the enrollment of two black students, Vivian Malone and James Hood. Famous for his 1963 inauguration speech, in which he advocated for “segregation today, segregation tomorrow, segregation forever,” Wallace posed strict opposition to enrolling Malone and Hood. His opposition, however, was a failed attempt as the students were ultimately allowed to enroll at the University. Even with all of the controversy surrounding their acceptance, Malone and Hood were not the first black students to enroll at UA. Autherine Lucy Foster was accepted and spent three days at the University in 1956. After threats, attacks and mob violence, UA officials told Foster they could not protect her, and she was eventually expelled. How is the recognition of this event and these students a strategic public relations move for the University? The math is pretty simple. A predominately white university with a history of segregation + a significant tribute to three iconic black students = a milestone in acceptance and diversity. Instead of seeking to hide its dark past, UA used a transparent method of communication and highlighted the problems with its past by honoring the progression of its present. In early 2010, UA administration tossed and turned about what to do with the famous Foster Auditorium. The building certainly reached its peak; literally falling apart, Foster Auditorium desperately needed renovation. UA administrators sought student input. They held several meetings and invited students to cast their votes and share their opinions about remodeling decisions. This provides another great example of strategic PR; two-way communication is key in engaging an audience, and UA allowing student input was the perfect model. Now, almost one year later, UA not only remodeled the building while still preserving historic remnants but also held a day-long event in honor of the three students. On Nov. 3, 2010, Foster, Hood and a family member of Malone participated in a panel discussion regarding racial discrimination and injustice at predominantly white universities. Following the panel discussion, UA honored the three at a private luncheon. The climax of the day-long celebration was the dedication of the newly modeled Malone-Hood Plaza and Lucy Clock Tower at Foster Auditorium. UA’s president, Dr. Robert E. Witt, welcomed the three icons and shared his gratitude of their presence on campus. Representatives from the Student Government Association and Black Student Union were also a part of the program. Today, UA is the No. 2 public flagship university in the nation in the enrollment of African-American students, who represented more than 12 percent of the student body in the fall semester of 2010. Within the past two decades, UA increased African-American undergraduate enrollment by almost 70 percent. With the recent release of these stats, UA’s dedication couldn’t have come at a better time. In addition to honoring the students, the dedication served as a strategic PR move to help polish UA’s image and alleviate the stigma attached to Wallace’s Stand in the Schoolhouse Door. Do you think this helped mend UA’s historic reputation? That was just one of more than 3,600 responses to a Marie Claire blogger’s post called, “Should ‘Fatties’ Get a Room? (Even on TV? ).” The post, in which blogger Maura Kelly addresses her disgust for overweight couples on television shows like the CBS sitcom “Mike & Molly,” has been the root of Marie Claire’s latest public relations disaster. Based on the the impassioned responses to the post, the overwhelming consensus is, yes, Maura Kelly is being an insensitive jerk. However, Maura Kelly is not the only one under fire for the blog; Marie Claire is, too. “I would really like to apologize for the insensitive things I’ve said in this post. Believe it or not, I never wanted anyone to feel bullied or ashamed after reading this, and I sorely regret that it upset people so much . . . People have accused me of being a bully in my post. I never intended to be that — it’s actually the very last thing I want to be, as a writer or a person. But I know that I came off that way, and I really cannot apologize enough to the people whom I upset,” she wrote. It’s obvious Maura Kelly’s apology will never completely smooth things over. However, it’s important to note she took a step away from her hostile comments to try to amend her relationship with Marie Claire readers. Editors and other leaders within Marie Claire’s ranks, however, neglected to try to preserve the relationship they share with readers. Instead of issuing a formal apology, Marie Claire editor Joanna Coles responded by saying Kelly is “a very provocative blogger” and “she was an anorexic herself and this is a subject she feels very strongly about.” Instead of reprimanding Maura Kelly, Marie Claire chose to stand by her side in support. Marie Claire took the hands-off approach to the issue because the article was published on a blog and not in the magazine. What Marie Claire failed to recognize is the blog remains hosted on its website and the public affiliates the blog and Maura Kelly with the magazine itself. The connection seems strong enough that the blog post may as well have been published in an issue of Marie Claire. In addition, allowing Kelly to post the blog further damages Marie Claire’s reputation because, instead of applauding individuals of all shapes and sizes, the blog openly criticizes the obese. Granted, obesity is one of America’s greatest health issues; but, the manner in which Kelly brought up the problem was highly offensive. The post secured Marie Claire’s position as yet another women’s magazine perpetuating the ideal (and unreachable) standard of “beauty” that causes such low self-esteem in women and girls. Marie Claire’s choice not to address the blog fueled the public’s uproar and affected Marie Claire’s reputation negatively. Many people say they will never purchase issues of Marie Claire magazine again and Marie Claire lost their support. Others canceled their subscriptions. Some even decided to hold a “Kiss-In” protest at the Hearst Building in Manhattan. By simply acknowledging the harm done by Maura Kelly’s post and issuing a formal apology, Marie Claire could have salvaged its reputation. But that apology will never come, although readers are still waiting. How do you think Marie Claire should have reacted? Do you think its reputation has been harmed?